Ved Pratap Vaidik’s meeting with Hafiz Saeed generates more controversy than it should have. 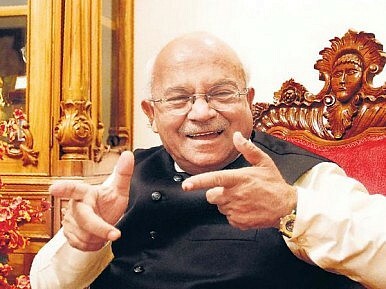 Ved Pratap Vaidik is not a well-known name in the field of journalism in India. After working for three decades as a journalist, he remains relatively unknown. Lately, he has been associated with the popular but controversial yoga guru Baba Ramdev rather than journalism. However, recently he has become widely discussed in newspapers, television stations, and in parliament itself. Why? Because Vaidik managed to do what no other journalist in India has previously done. He managed to meet the alleged mastermind of the 2008 Mumbai attacks, Hafiz Saeed, India’s most wanted terrorist. Saeed is the amir of Jamaat-ud-Dawa, the political wing of Lashkar-e-Taiba, a terrorist organization based in Pakistan who has been banned in India, the United States, Russia, Australia, and the European Union. Vaidik landed in Islamabad, Pakistan last month with a select group of journalists, foreign policy experts, and politicians in order to attend a Track-II conference on Indo-Pakistani relationships organized by the Regional Peace Institute. However, while the other participants returned to India after the conference, Vaidik stayed in Pakistan in order to meet Saeed. Vaidik did not reveal this fact for two weeks after returning to India, when he released a picture announcing that the meeting took place. He did not reveal what transpired in the meeting. Within hours, Vaidik’s meeting with Saeed became a major story all over India. Questions were raised about the purpose of the meeting, its meaning, and the ethics of interacting with a terrorist. There was also speculation as to whether he was acting on his own in hopes of aiding the peace process between India and Pakistan, or if he was opening up a back channel for diplomacy on behalf of the Indian government. This latter point of speculation is a possibility because of his political affiliations and his ties with the Rashtriya Swayamsevak Sangh (RSS), a right-wing Hindu organization that backs the ruling Bharatiya Janata Party (BJP). This makes it hard to believe that Vaidik’s meeting with Saeed was purely journalistic. Much of the Indian media hyperventilated over Vaidik’s meeting with Saeed, making grand and exaggerated statements. The media claimed that Vaidik’s meeting was an insult to the victims of the Mumbai terrorist attacks in 2008, the Mumbai bombings of 2011, or even an anti-India act of sedition. This reflects poorly on India’s media, demonstrating its paranoid and prejudiced nature and its ability to make anything seem controversial. The media’s attitude makes the prism through which the average Indian views the world narrow and paranoid. The media’s habit of stirring up controversy makes it difficult for the Indian government to make progress with Pakistan or even China on a variety of bilateral issues. But if one thinks about it rationally: what really is the harm of a journalist meeting an enemy? The attitude of parliament is similar to that of the media. Whichever party is in opposition in India always makes a controversy out of little things. Last week, the opposition Congress Party disrupted proceedings in parliament due to this issue. Yet, previously, when the BJP was in opposition, it disrupted proceedings due to similar reasons. Last year, it protested the meeting of a separatist leader from Indian Kashmir with Saeed in Islamabad, Pakistan. The BJP then argued that Pakistan needed to punish the perpetrators of the 2008 Mumbai attacks before any headway could be made in talks between the two countries. Now that it is in power, is the BJP’s position on this matter different? India’s competitive political and media parochialism is clearly on display in its attitudes towards Vaidik’s meeting with Saeed. Ultimately, the larger question remains unanswered: why did Vaidik meet with Saeed in Islamabad? Saeed is not easily accessible and anyone seeking to meet with him does so with the consent of Pakistan’s powerful spy agency, the Inter-Services Intelligence (ISI). Was Vaidik carrying some message from the government in New Delhi? Is this an attempt to engage with a man who is central to peace between India and Pakistan? This is entirely possible, especially since no interview has been released, casting into doubt Vaidik’s claim that his meeting with Saeed was purely journalistic. Pakistan’s likely cooperation also indicates its willingness to negotiate with Indian Prime Minister Modi’s government as well. However, the meeting between Vaidik and Saeed has generated so much controversy that it might be impossible to use it as the basis for improved relations between the two countries. The media’s attitude has yet again made it difficult for India and Pakistan to talk candidly and openly. Nonetheless, individuals like Saeed and Vaidik have nothing to complain about, as they thrive on controversy. Zakiur Rehman Lakhvi, the man who planned and financed the November 2008 terror attacks in Mumbai, was granted bail.